After his run of early 60s hits had dried up, Dion had spent several years in the wilderness before making his comeback with a mature folk-rock sound in 1968, with the hit single "Abraham, Martin & John" and a splendid self-titled album on Laurie Records Following this Columbia Records (who he had been with for these 'wilderness years') quickly cobbled together enough recordings to make an album, to cash in on his sudden return to popularity. 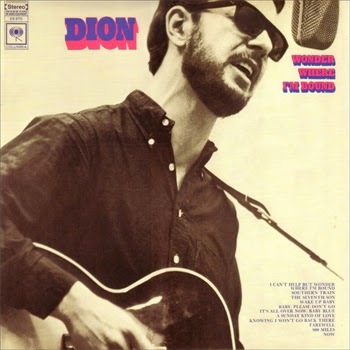 The appropriately-titled Wonder Where I'm Bound was a very interesting mix of different genres, a collection of various stylistic experiments Dion had been making after his original doo-wop / pop sound had fallen out of fashion. He had made some solid folk-rock after The Byrds popularized the genre (complete with jangling guitars and tamborine), and also some startlingly gritty blues after discovering the music of Robert Johnson. The album thus was not exactly cohesive, but the individual songs were all very strong, ranging from raw folk-rock, to lushly orchestrated numbers, to acoustic folk and blues, and one step back into doo-wop with a cover of "A Sunday Kind Of Love". Other covers included the title track by Tom Paxton, Woody Guthrie's "900 Miles", Willie Dixon's "Seventh Son", the blues standard "Baby Please Don't Go", and Bob Dylan's "Farewell" and "It's All Over Now Baby Blue". Overall a very good album showing what Dion had been up to between 1963 and 1968. Thanks for posting this lost gem. thanks,i bought that AM&J single but never knew of an album at that time so this is great to have the opprtunity to check out,and that write up seems to cover areas of music that i'm still fond of...over 40yrs later!